Angler opinion sits in split judgment on the effectiveness of Daiwa Samurai braid. It’s thinner than most 8-strand weaves, super smooth, and silent through your line guides. Bass fishermen can appreciate it for flipping with a spinning reel. 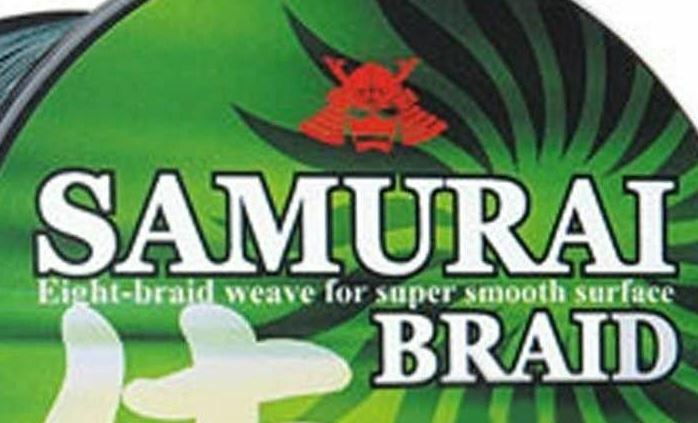 Unfortunately, for every advantage that Samurai braid offers lies a concern right behind it. Catch the conundrum on both sides of the line in the following detailed review. Overall Ranking: 74 out of 100. Daiwa Samurai shares some similarities with the Daiwa J Braid in that the Dyneema fibers are untreated. The carriers are set for a tight weave which helps make a smooth finished product. 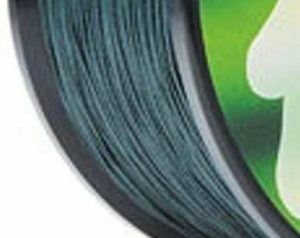 Because of the limp nature of the untreated braid, it performs best on spinning reels. Samurai braid is near noiseless when casting and with a thin diameter, anglers can put more line on their reel. But the braid has a tendency to fray. Casting distance isn’t necessarily better than with braids like Sufix 832 Advanced Superline or Power Pro Super 8 Slick. Flipping it under low lying branches or to a quick spot after the retrieve, however, reveals an area of superiority. Concerns rise again once your cast hits the water. Daiwa Samurai braid has plenty of reports of breaking off due to abrasion. One way to make a braid thinner is to use fewer strands. This is apparent in braids like Power Pro Maxcuatro which offers a thin 4-strand weave. Daiwa Samurai braid follows the same concept that Seaguar Smackdown uses. They thin out the strands instead of removing them. In a popular comparison, Dawai Samurai 30 LB test has a diameter of 0.010 inches. It has a mono equivalent of a 6-pound test. Power Pro Spectra (their base braid) 30 LB test has a diameter of 0.011 inches, equivalent to 8-pound mono. You’ll put more line on your reel with a thinner Samurai braid. Treated braids often have a slippery or waxy feel to them due to different types of treatments. Daiwa doesn’t treat their Samurai braid, which allows it to keep its soft nature. Suitable for use with baitcasting reels, limp braids perform better on the upright spool of a spinning reel. One benefit of a softer braid is a noticeable reduction in noise. Daiwa Samurai braid flows quietly through the line guides while casting as well as on the retrieve. Because it’s thin and soft, it also creates less of a disturbance in the water. When fish are spooky, a quiet retrieve can keep them around long enough to see your jig. Another benefit to using a thin braided line is less water resistance. By their own merit, braided fishing lines don’t sink very well. The Spectra or Dyneema fibers are buoyant and will always want to float. Even the GORE in Sufix 832 Advanced Superline helps only a little. Still, a thinner braid will have less surface area and so less water resistance. With the weight of your jig, it will fall faster down the water column. This quality can be helpful or detrimental. If fish are suspended in the column, you may want a slower drop. But when schools are on the move, like yellowtail so often are, it’s best to reach them as fast as possible. As braided lines should be, Daiwa Samurai will not have any observable elasticity. You can fish deep and still feel the smallest take of your line. The thin diameter is incredibly strong and will often cut through weeds in its path. For those unfamiliar with this type of line, it can some getting used to. Read up on the characteristics of braided fishing line to better prepare yourself. Using Daiwai Samurai braids brings the benefit of spooling more line on your reel. It operates with a lot less noise than rougher braids, both casting and retrieving. A thinner diameter will help the line cut through water on the drop, reaching its destination faster. Another advantage of soft braid is it doesn’t wear on your gear as much. 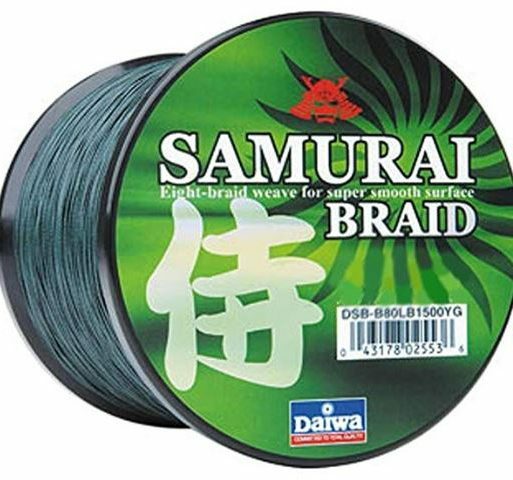 Finally, Daiwa Samurai braid is often more affordable than treated top name brands. 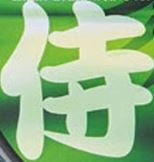 Though Samurai braid is effective in the right conditions, anglers have more than a couple of concerns after using it. Because the braid is thin and flexible, it’s difficult to work with. Especially when it gets soaked, fixed knots and line connections prove difficult and time-consuming. Another area of breakdown to be aware of is line compromise. Any knicks or frays will reduce the line strength, resulting in more break-offs than thicker braided lines. It’s best to use a rod specifically made for braided lines due to their stronger line guides. Green as the only color is a limiting factor as is the low choice in spool lengths. It will be more attractive to anglers if Daiwa decides to add some colors. Daiwa Samurai braid works well for flipping. Unfortunately, the soft nature of the braid means it’ll fray faster in reeds or lily pads where anglers are likely to be flipping. Check your line and re-tie it if you see any damage. In open water, Samurai gives you more line to let the fish run. Because it has a faster drop rate, use it to reach moving schools or with a drop-shot rig. Though Daiwa takes pride in quality customer service, like most brands, they don’t offer a warranty on braided line. Most of their service addresses their rods and reels, but you can still reach out for information. Visit their Frequently Asked Questions or click over to Daiwa’s About Us page. It’s there you’ll find the contact info via email, phone number, or physical address. Though Daiwa Samurai doesn’t reach the highest marks, it does have its uses. In open water or for drop shot fishing, Samurai braid can improve your performance. Be aware of the concerns if you use it and check your line often, a habit that’s good to get into anyway. If you know of additional concerns or advantages while using Dawai Samurai braid, please leave them for other readers in the comment section below. Thanks for reading and hope the review adds to your knowledge. Tight lines until next time. FishtFight.com.